The World Health Organization estimates that some 235 million people suffer from asthma around the world. Other chronic respiratory conditions, including bronchitis, chronic obstructive pulmonary disease, respiratory allergies, and pulmonary hypertension are on the rise worldwide and are among the major cause of visits to primary health care centers. These chronic pulmonary diseases are prevalent enough now to be considered epidemics and are becoming worse as the rate of urbanization increases the world over. Chronic disease patterns often begin to develop in childhood, and so by their very nature present opportunities for prevention. Many disease patterns if recognized early enough can be easily avoided before they become chronic. Sadly, until more attention is paid to preventive medicine and a little bit of old-fashioned common sense, preventable diseases will continue to become epidemics as traditional cultures and their embodied wisdom become lost to urbanization. 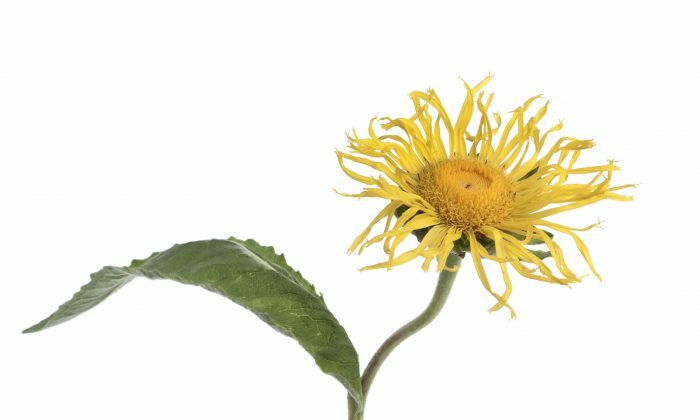 Elecampagne (Inula helenium) is an herb that is highly effective for those conditions relating to the lungs. It acts powerfully, stimulating blood flow and promoting the coughing up of wet mucus and waste matter, increasing lung capacity and making more oxygen available in the blood. With greater oxygenation, the body is better able to burn out infection. Add to this antiseptic properties and a substance called allantoin, which is a cell-proliferent and demulcent, elecampagne also speeds up the rate of healing for damaged lung linings. Furthermore its mildly bitter properties aid recovery from illness by improving digestion. Given these properties it is not surprising that elecampagne has been used throughout history as a specific treatment for tuberculosis. Taking this herb in the early stages of infection often meant that lungs were able to actively remove the TB bacilli. It was also taken by the families and anyone in contact with the patient as a preventive measure against the disease. Elecampagne is prescribed by herbalists alongside herbs such as garlic and echinacea for respiratory infections including bronchitis, tracheitis, and bronchial asthma. Perhaps the greatest benefit of this or any herb is the lesson it can teach us with regards to how we can prevent a lifelong pattern of disease from developing early on in life. The lesson of elecampagne is most apparent for me in the slouching posture of a child, forced to sit for too long in a classroom. Such a position is bad news for respiratory organs. If bad posture is not corrected at a young age, then lifelong habits may develop where oxygen supply to organs is badly inhibited. All over the developed world, young people can be seen slouching their upper torsos forward and down. This often leads to shallow breathing where the lungs are lifted up by the shoulder girdle from above, rather than the much deeper breaths that come from diaphragmatic breathing. Do your children or teenagers lift their shoulders up with the effort of taking a deep breath? Do they tend to sigh a lot? Is their skin color a bit pale without that pink tinge? Do they hunch down over their solar plexus, restricting the diaphragm? These are all signs of bad postural habits starting to develop, habits which can lead to respiratory conditions later in life. Yoga breathing exercises may be just what they need to re-educate themselves out of these negative patterns. If these habits are allowed to continue they may experience further deterioration due to poor oxygen transport. Pale skin may deteriorate to a cold feeling in the limbs even in hot weather; poor hair health, memory lapses, difficulty concentrating, and chronic tiredness are symptoms. If alongside all these symptoms they also have asthma and recurring bouts of bronchitis, then they will definitely need elecampagne prescribed by an herbalist as well as various other lifestyle changes. The people who do not need elecampagne prescribed for them are typically those people who are physically active, often well into old age, and of course with good posture. It may only mean going for a walk instead of sitting in front of the television, but they are much happier when they are active. Elecampagne is another herb with an ancient record of use. It is indigenous to Asia from where it is believed to have spread throughout Europe and North America. It was first mentioned in ancient Indian pharmacapoeas. Its medicinal benefits were also described by the ancient physician Dioscorides. The Roman writer Pliny quotes Emperor Julius Augustus as proclaiming “let no day pass without eating some of the roots candied, to help digestion and cause mirth.” An old Latin proverb goes, elecampagne will the spirits sustain. The herb features commonly in both Anglo-Saxon and Nordic cultures, where it was commonly used in ritual and medicine. From the root of this herb, these northern European cultures manufactured what was probably the first cough drop. This practice persisted throughout the Middle Ages and right up until the 1920s. See a professional herbalist if you think you would benefit from this herb. Care should taken with dosage especially in cases of bronchial asthma. Luke Hughes is a classical Western herbalist and horticulturist based in Sydney, Australia.